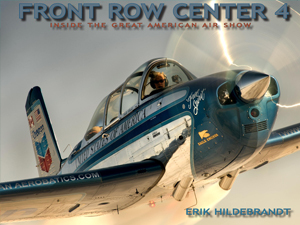 The latest installment of FRONT ROW CENTER: Inside the Great American Airshow has hit the streets! Considered by many to be "the best one yet", this all new volume of images was produced over the 2008 air show season and features incredible photography of the industry's brightest stars. Preview FRC4 here and order your personally signed copy today and received free domestic shipping anywhere in the US. International orders do require an additional $30 PayPal payment to cover USPS Priority Mail.